A lobby is a room in a building used for entry from the outside. 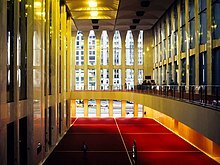 Sometimes referred to as a foyer, reception or an entrance hall, it often is a large, vast room or complex of rooms (in a theatre, opera, concert hall, showroom, cinema, etc.) adjacent to the auditorium. It is a repose area for spectators and place of venues, especially used before performance and during intermissions but also as a place of celebrations or festivities after performance. Since the mid-1980s, there has been a growing trend to think of lobbies as more than just ways to get from the door to the elevator but instead as social spaces and places of commerce. Some research has even been done to develop scales to measure lobby atmosphere to improve hotel lobby design. Many office buildings, hotels and skyscrapers go to great lengths to decorate their lobbies to create the right impression and convey an image. Supertall skyscrapers can often have one or more of what is known as a sky lobby, an intermediate floor where people can change from an express elevator that stops only at the sky lobby to a local elevator which stops at every floor within a segment of the building. A foyer in a house is usually a small entry area or room by the front door. Other public rooms such as the living room, dining room, and family room typically attach to it, along with any main stairway. It was initially intended as an "airlock", separating the fireplace-heated rooms from the (colder, in winter) front entrance, where cold air infiltration made for cold drafts and low temperatures. It is commonly used for outer garment and umbrella storage for both residents and guests.